I remember at the turn of the century, I’m in the supermarket wanting to get some red bell peppers. But I see the price at $2.50 each which seems expensive and so pass them by, which is a shame because, like that old Iron Chef Host, I really love them. I decide I am going to grow my own and get them for free. After going through all the hassle of obtaining plants, fertilizer, special dirt and the labour involved, my three plants yield 6 small misshapen peppers which don’t get red all the way. So I give up and decide to cut corners elsewhere. I am thinking of this two days ago when I buy “reduced for quick sale” red peppers. I think they look very good despite being discounted and decide to make stuffed peppers. I make them a little different than the usual stuffed peppers, but they are quite good groceries for all that, I assure you. No boring ground beef, nay, but a toothsome creamy rice filling that makes a mouth happy. Look this over and see if you don’t think it’s a culinary delight for any night, a winner at any dinner and a side dish that’s delish. A minute later, stir the garlic in. Now put the olives and lemon juice in and keep stirring until it starts to dry out. Add a ladleful (1/2 cup) of simmering stock and stir well. Let it dry. Keep repeating this procedure until the stock is almost depleted. Taste a grain of rice for tenderness. If the rice at this point is still too firm and the stock is used up, add a ladleful of hot water, watch that the rice does not burn. The rice should be especially creamy, not runny or soupy. When done, add the cinnamon, walnuts, parsley, oregano and the mint, and taste for salt and pepper. Remove from the stove and set aside covered. In a large enough pot to hold 6 red peppers, bring a quart of water to the boil. Fill a large bowl or pot with cold water and add ice to it. While water is heating, rinse the peppers and remove the inedible parts of the tops. Now slice the peppers in half vertically (from top to bottom) scrape out the seeds and the white part of the ribs. Blanche the peppers in the boiling water for 2-3 minutes and then plunge them into a bowl of ice-water. Stuff the halves with the rice mixture. Sprinkle cheese over the rice mixture. Put the peppers in a shallow baking pan, or pans. Bake for 30 minutes at 350F. Or, you can microwave them (providing you are using microwave-appropriate equipment, like glass) for 8 to 10 minutes; in which case, only put the cheese on the peppers for the last minute. mmmmmmm peppers, one of my all time faves. my mother-in-law also makes an awesome bell pepper pasta dish. I love eating them raw too, cut into strips. Italians always look at me like I'm mad when I do. They seem to think it will cause irreparable harm to your digestive tract if you ever eat veggies raw, the only exceptions being tomato, lettuce, cucumber, and carrot. Yeah, eating peppers raw is very good for you (and your teeth). Nothing is cooked down, your metabolism gets a nice workout. Italians (Italian-Americans) I know love the fennel flavoured Italian sausage stir fried with peppers. I can smell the aroma right now. I love peppers and this looks amazing. I may just have to try it! one of my favorite smells in the kitchen besides bread baking and slow cook pork cooking is the smell of peppers on the stove. This looks delicious! next time I'll have to make it your way. YUM! CHATON: My BW thinks they are amazing, this is a good use for red peppers. Thank You. JOANNE: I baked a loaf of white bread (with an egg in it and a nice glaze on top) for sunday school teaching project with our homegrown red plum jam. Were only 3 children, I thought would be leftovers, they had seconds and thirds, it was good I guess. The greatest compliment I receive is when people enter our home and invariably say: "Boy, it sure smells good in here". I love the aroma of curries in the kitchen and foyer. Just made fordhook small dried green limas with hickory smoked sausage yesterday, wow I wish I could bottle it. Just now saw your comment. Clean your langostinos,then fry in a hot pan. I fried the red snapper filets on the skin side first, then flipped them for a short while. Cook the beans in very salty water (26 grams, according to some famous cook) to 2 liters of water. Then place them in icy water. For the sauce I used 2 tablespoons of a commercial lobster-butter. This was added to a chanterelles and a shallot, chopped and fried in butter, and de-glazed with Noilly-Prat. Add a small glass of fish stock. I added some olive oil at this point, but of course you can use butter or nothing at all instead. The noodles shoud be ready at this point. Mix and enjoy! These would kill my wife, but I would enjoy them! ALEX: Thank you for responding, that seafood recipe is delightful. Wish I could translate your blog to English, it looks interesting. ALEX: I would not want you to grieve the loss of your spouse if she devoured them, so please steer clear of this fabulous but deadly dish. My only question is: Why would it kill her? This could be another comfort food from my youth. Red peppers are the fully matured green peppers, if I remember correctly from my horticulture days. Most people can't digest the green unripe peppers but can the red. Help me on the yellow. I forgot. Is that an entirely different variety? In New Mexico, stuffed peppers weren't bell peppers - they were Jalapenos! CIARA: Thank You for those kind words. MANZANITA: Yes, green bell peppers are unripe peppers, but when cooked are digestible. The red bell peppers, as well as the yellow, are the fully ripened peppers, same species, different colours due to phytochemical (plant chemical) carotenoid (antioxidant) profile. There are orange, purple and even black bell peppers, but not all readily available. They are all capsicums with varying degrees of sweetness. L. Diane: Thats right, and Anaheim chilies too. A neighbour once told me about battered cheese stuffed jalapenos that were deep-fried. I asked: How do they keep the cheese from oozing out? She told me if you freeze the cheese batons slightly they fry up perfectly. She used to come over and play scrabble every friday night for awhile, and I started serving them with the weekly pizza. Both were welcomed. Thanks for reminding me. SCHMETTERLINGWORDS: You are correct, the rice is made rissoto-like for the creamy outcome. Thank You for your comments. Wow what a great pepper stuffing love the cheese just oozing on the outside there amazing flavors here, I dont think you made enough, I would eat the whole pan, no one would get any! This sounds like a very tasty recipe! PEGASUS'ND: Sorry about the onion allergy, I appreciate your response. AMANDA: It is very tasty, I hope you will try it. The stuffed red peppers sound delicious!! I'm also trying to grow my own. I have a couple nice sized green ones on the vine, so I'm waiting impatiently for them to turn red. When they do, I'm going to try your recipe! DARLENE: Best of luck with your peppers, my tomatoes are doing great now that I planted them over the septic tank, next year planting peppers there too CM. 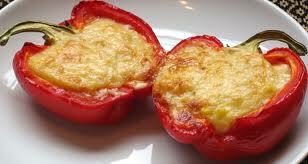 You will love these kind of stuffed peppers. SAMANTHA; Say, these would go great with your pastis shrimp. I left you a well deserved award on my blog. Thanks for all you recipes. SHELLIE: Thank You for those kind words, I appreciate it. AIPI: I love Indian food, would love to try your potato stuffing in peppers. Thank You, and if you know where I could find that recipe I would be most grateful. I so wish my hubby liked peppers. That's his least favourite vege. I stopped eating them when I married him. lol. Cheesy and yummy! Looks very appetizing. What a yummy recipe. I'm going to have to try this one. I think my guys will enjoy it, too! There is a very popular recipe for Pfifferlingsfricasse here in Germany. Use a 1/2 pound of chanterelles, a diced shallot, and cut up parsley. Clean the chanterelles using a brush (water makes them soggy). Cut the larger ones into bite sized pieces. Saute the shallot, add chanterelles and sear on high heat. They will lose their water quickly. When almost dry, add a cup of cream and reduce a little bit, to let the flavors meld. Here, the fricasse is served with bread dumplings (Semmelknoedel) and is a specialty of Bavaria. It's an absolute culinary delight. Looks amazing. I love peppers. Definitely gonna give a try. ALI: Happy you liked it. LYNDA: Try making these stuffed peppers and ask him to just eat the stuffing. Maybe he'll accidently bite into the red pepper and experience a taste sensation; or at least give you a chance to eat some capsicum. DIEGO: Thank you for your comment. UMM: Yes, creamy, delicious, visually appealing, the whole nine yards. Thank You for commenting. SUSANNE: If you like peppers, and creamy risotto-like rice, you're sure to fall in love with these stuffed peppers. ALEX: Thank You so much for your pfifferling frikasse recipe. Wish I could translate your blog to English. HEMALATA: Coming from you, if you say it's a delight, thats proof enough for me. Thank You. I've only recently begun to appreciate stuffed peppers. It all started with chile relanos.But they have to be done just right. There are only a couple places near me that can make a really good chile relano. STEPHEN: You are right, chile rellenos takes a deft hand to make. Back in the '70's I worked in a mexican restaurant and one lady, from Puebla, made them. When she was out, the rellenos were different. The egg whites cannot be overmixed. KEENA: Is, Thank you, I hope you'll try it. Growing your own sounds like a great idea. And the stuffed peppers sound delicious! INDIE.TEA: The stuffed peppers are truly wonderful, I assure you. Home grown are best, if you know ut to grow them. MISHA: Yes is yummy, but Miss Misha, - Why not have your spouse do all this cooking for you; you know what they say - teach a man to cook, he feeds his family for life. creamy0cheesy rice filling in the pepper has my attention !! It looks delicious but not easy to make it. TORVIEWTORONTO: Thank You, yes the mint is good here. For awhile my mint plant grew so prodigiously I had to use as much as I could. It and the coriander are crowding the garden. PRIYA: Yes, this is a welcome diversion from the usual, I'm so pleased that you like it. GABRIELLE: It is definately delish; I think it is not difficult to make, but you be the judge. Please try it and see. SARAH: Good,you will enjoy dining on them as much. JISHASKITCHEN: Thank You. I'm happy you liked it. SARAH ALLEN: Is delish squared, but simple to prepare. Thank You.